The Macleod Gazette editor and publisher Frank McTighe accepts the Bill Draayer Award from Mary Jane Harper, former publisher of the Olds Gazette and a previous recipient of the award. The award has been presented each year since 1983 to a weekly newspaper person for outstanding contribution to the progress and development of the Alberta Weekly Newspapers Association. The publisher of The Macleod Gazette has been honoured for outstanding contributions to the Alberta Weekly Newspapers Association. Frank McTighe received the 2007 Bill Draayer Award on Sept. 15 at the AWNA’s fall convention. 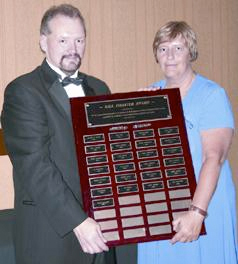 “Frank has gone about his work for the association on the provincial and national level with steadfast dedication, without thought of personal reward and with considerable sacrifice of personal time away from his family and business,” said Mary Jane Harper, former publisher of the Olds Gazette and a previous Bill Draayer Award recipient. The award is named for long-time newspaperman Bill Draayer, who was publisher of the Wetaskiwin Times for 25 years and manager of the AWNA. The award has been presented each year since 1983 to a weekly newspaper person for outstanding contribution to the progress and development of the AWNA. McTighe’s work for the association began in 1992 when he was elected to the board of directors. McTighe was corporate secretary for five years and served as vice-president before becoming president in 1997. In addition, McTighe chaired the Better Newspapers Competition, the technology and membership committees, and represented AWNA on the Alberta Press Council. McTighe took a break from the AWNA board while he taught journalism at SAIT Polytechnic and with his wife Emily bought The Macleod Gazette. Then in 2004 McTighe was elected to a three-year term as one of three Alberta representatives on the Canadian Community Newspapers Association (CCNA) board of directors. Since returning to the AWNA board, McTighe has chaired the industry education, nominating and AWSOM Archive committees, while serving as member of the history book and symposium committees. McTighe is in his third year as chair of the Verified Circulation committee for CCNA, and is a member of the Better Newspapers competition committee. McTighe was re-elected Sept. 15 to a second three-year term on the CCNA board. “I cannot think of anyone more humble about his work for this association, or more deserving of this award,” Harper said. McTighe thanked his friends in the newspaper business and his family for their support and encouragement.